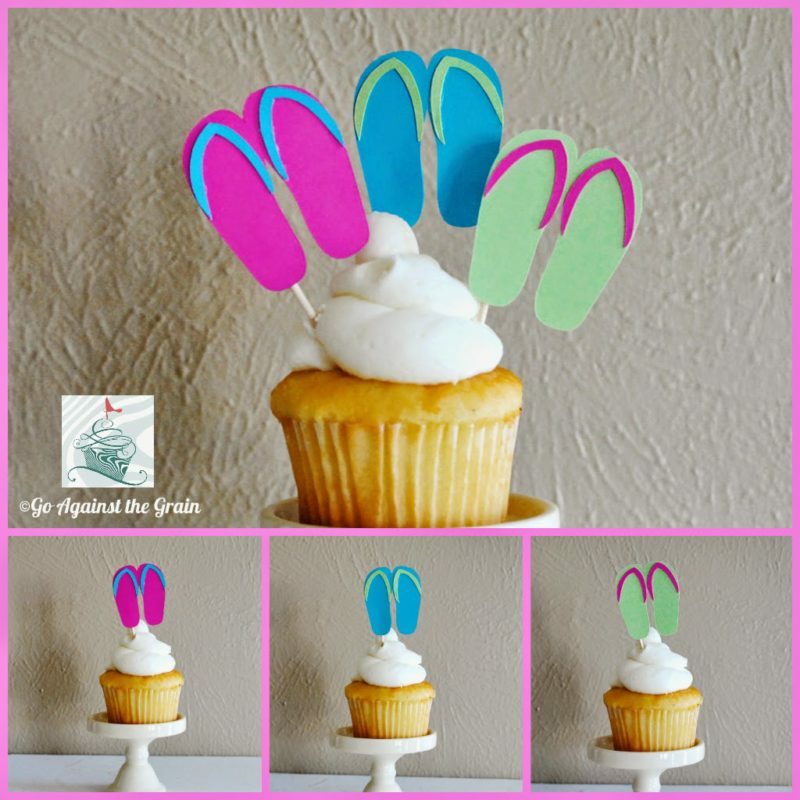 Today a very sweet fellow party girl is sharing her adorbs Flip Flop Cupcake Toppers! Laurel from Go Against the Grain is so talented! Go Against the Grain is the perfect place to find all your party/event accessories as well as graphic design services. Founded by Laurel in 2008, her work has been featured on the pages of Brides Magazine US & UK, Well Wed Magazine and Weddings in Winnepeg. She has also been featured on several blogs like Style Me Pretty, Hostess With the Mostess, On to Baby and more! Laurel loves working closely with her clients to create the perfect details that will add those special touches to events and parties, or just to make everyday more fun! It is officially Summer and that means BBQs, pool parties, the beach and of course FLIP FLOPS! (Though here in California and in Texas where Laurel lives we can almost wear flip flops year round!) These flip flops are not for your feet but they will make your cupcakes the talk of the town because they are so stinkin’ cute! I am going to make up a batch of margarita cupcakes just so I can use them. Seriously. These cupcake toppers are the perfect addition for your summer parties! Available in all kinds of colors and patterns too! Guess what? Laurel is going to give one lucky reader a set of flip flop cupcake toppers! Lucky reader!! If your cupcakes need a little flip flop fun you can find Laurel at goagainstthegrain@yahoo.com, Facebook, or her Etsy shop. Thank you so much for sharing, Laurel!! Contest is open worldwide from July 9 – July 16, 2013. All entrants must be at least 18 years of age. Winners will be selected randomly via Giveaway Tools. The odds of winning are dependent on the number of people entering. Should the winning entrant(s) not respond within 48 hours of being emailed, another winner(s) will be selected. Please ensure kylie@partiesinstyle.com is on your safe email list. We would hate to have to redraw another winner! Free US shipping is included. Should an international winner be chosen, that winner is responsible for any and all shipping costs and fees. These costs and fees must be paid prior to shipping. If you do not agree with these terms, you are not eligible for the prize. This blog was not compensated for being part of the giveaway and all opinions are our own. The prizes will not be shipped by Made by a Princess Parties in Style, we are not responsible. This event is in no way associated with Facebook, Twitter, Pinterest or any other social media network. If you have any questions about the giveaway you can contact Kylie kylie[at] partiesinstyle [dot] com. Good Luck! Made by a Princess is not responsible for prizes (beyond our own) and the shipment thereof. Any issues that arise must be taken up with the sponsoring business directly. Cash prizes are not being awarded. Prizes cannot be turned into for cash. Prize from vendor/s is not transferrable and cannot be traded for another item. Should the vendor offer customization of the product you will be responsible for additional fees.